1. In The Lion King, Scar is the ONLY lion that constantly has his claws showing. 2. In an extended scene in Aliens, the photo Ellen Ripley is given of her daughter after spending 57 years in hypersleep is actually actor Sigourney Weaver's real-life mom, Elizabeth Inglis. 3. In Star Wars: The Last Jedi, during Kylo Ren and Luke Skywalker's lightsaber battle on Crait, Kylo's feet leave marks in the salt but Luke's do not, hinting the match-up isn't quite what it seems. 4. In Mad Max: Fury Road, Furiosa has a skeleton arm drawn on the driver's side of her rig, the same side that her missing arm is on. 5. In Black Panther, the outfits of Nakia, T'Challa, and Okyoe during the casino scene were specifically chosen to represent the pan-African flag. 6. In Hook, while the children are being kidnapped, you can hear a dog barking outside. The dogs FINAL bark is actually a gruff voice saying, "Hook!" 7. 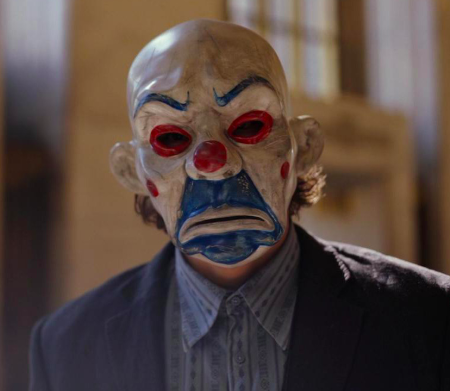 In The Dark Knight, the Joker's mask during his first appearance is a subtle nod to the mask Caesar Romero wore in HIS first appearance as the Joker back in 1966. 8. In Deadpool 2, while Deadpool is drawing out the rescue plan, there is a note about "Prisoner 24601." This is a subtle nod to Deadpool's obsession with Hugh Jackman and his role in Les Misérables as Jean Valjean. 9. In Talladega Nights: The Ballad of Ricky Bobby, Ricky Bobby is asked what "America has contributed to the world," but all of his answers were developed in other countries. However, the "crap" jazz music he demands they turn off is American artist Charlie Parker. 10. In Dead Poet's Society, the photo the boys find of Professor Keating in the yearbook is actually Robin Willam's REAL high school yearbook photo, which Williams also used as the cover for his album Throbbing Python of Love. 11. In Pirates of the Caribbean: At World's End, there is a sea turtle in the boat the crew packed up for Jack Sparrow. This is a subtle nod to the original movie when he claimed he escaped an island using nothing but sea turtles. 12. In Scream, the last question Ghostface asks Casey is to guess which of "two doors" he's at, but the reveal at the ending that there are TWO killers shows that she would've lost no matter her guess. 13. In Tangled, baby Rapunzel has a little Pascal and Maximus on her mobile. 14. During the party sequence in Hereditary, two teenage girls are seen watching a silent movie involving a guillotine sequence. 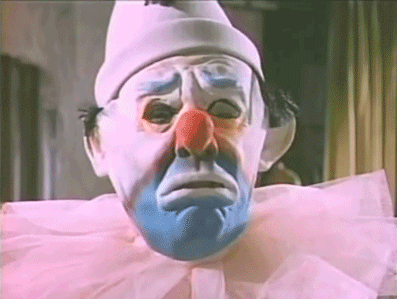 This is subtle foreshadowing, as beheading is a MAJOR theme throughout the film. 15. During a fight scene in Fight Club, you can see the Narrator's head nod upward in the upper left corner, right as Tyler Durden is kicked in the face, subtly signaling their connection. 16. When Butch goes back to his apartment to retrieve his watch in Pulp Fiction, you can hear an ad for the "Five Dollar Shake" at Jackrabbit Slims on a TV in a house he walks past, the same shake Vincent complained about earlier in the film. 17. In Avengers: Age of Ultron Hawkeye's son is wearing a onesie revealing his full name is "Nathaniel Pietro Barton." The middle name "Pietro" is in honor of Quicksilver, whose real name is Pietro Maximoff. 18. 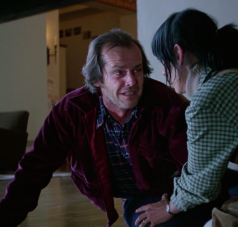 And finally, in The Shining, Jack wears the color green in every single scene up until his dream about Danny and Wendy. 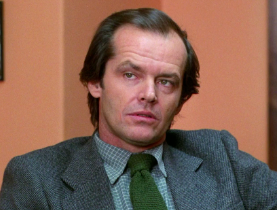 After that point, he wears red in every scene.